Congratulations to ALRP Staff Attorney, Brandon Lawrence, who received the 2016 Minority Bar Coalition Unity Award at the MBC Unity Awards on November 16, 2016. This award recognizes attorneys who have been exemplary in promoting the cause of diversity and inclusiveness in the legal community. 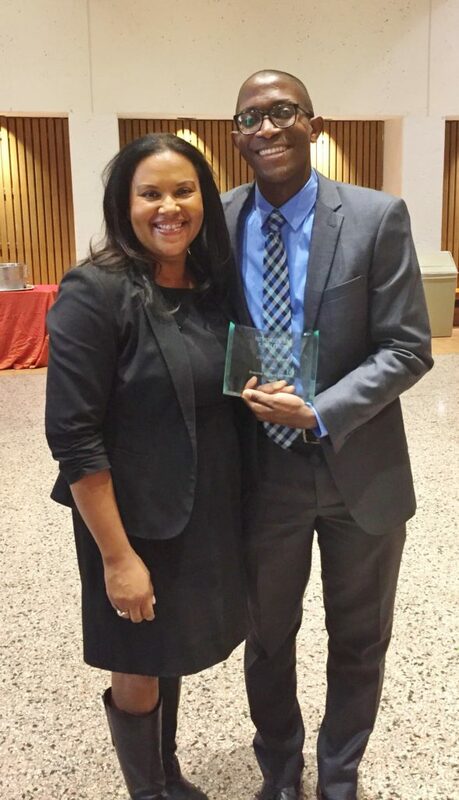 Nominated by the Bar Association of San Francisco’s Elizabeth McGriff, Brandon is ecstatic that Ms. McGriff selected him as this year’s awardee. Brandon works with the BASF’s Destination Law School Program, its Open Doors 1L Job Shadow Program, and speaks on many Destination Law School Panels, which are targeted to educate and provide resources to diverse undergraduate students who aspire to attend law school. “I don’t do this to get recognition or to feel like I’m some powerful attorney, but I feel like I owe it to the profession to ensure the legal field is not only diverse but inclusive as well,” said Brandon about his great contributions to diversity work. The list of programs Brandon works with through BASF is impressive but the details of his individual efforts say even more about his dedication. Brandon motivates young minority generations by speaking to high school and college students about why they should attend law school. He also judges mock trial competitions where he can share his expertise with students. Even more, he mentors current law students and fellow attorneys by discussing his experience in law school and the challenges he faced. Brandon is also involved in diversity efforts outside of BASF. As an alumni of Johns Hopkins University, Brandon often conducts off-campus interviews for prospective students to spark their interest in pursuing the study of law. Brandon’s list of activities is only a glimpse into his efforts in increasing diversity in the law. In addition to his heavy case load as a staff attorney at ALRP, Brandon’s never ending dedication to the law community embodies the true meaning of selflessness. We here at ALRP are truly impressed with his efforts and cannot wait to see what he does next!